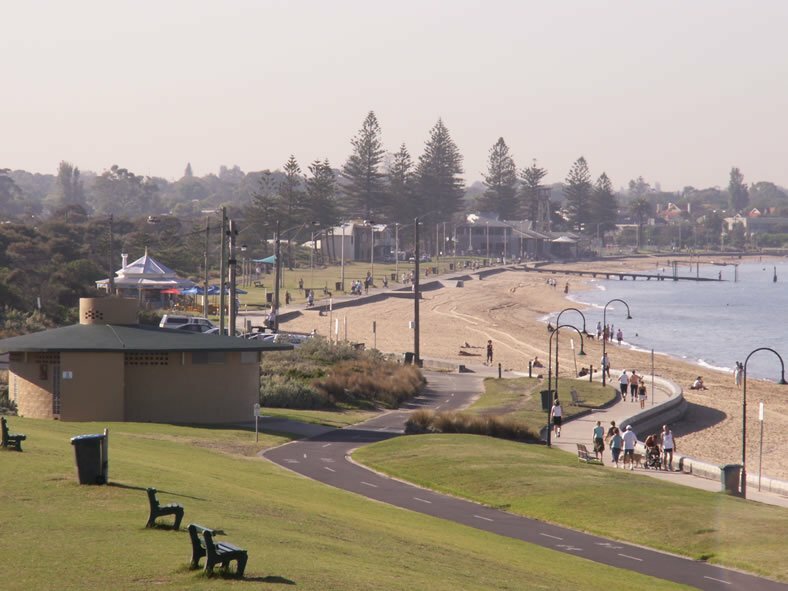 Elwood Beach is a popular bayside beach destination during summer, where the beaches are used recreationally for windsurfing, cycling, cricket and walking. The suburb has experienced ongoing gentrification, known for its mix of Edwardian and Interwar architecture character, its beaches and its leafy streets, many of which are lined by London Plane trees. Elwood was originally swampland; installation of the Elwood Canal turned it into an area suitable for residential development. Elwood was initially planned out around the two central geographic features of Elster Creek (now Elwood Canal), and promontory at Point Ormond, once known as Little Red Bluff. Fires burned for centuries on Point Ormond and it was here the Aboriginal Australians would cook shellfish, signal other clans and burn back country. Fever brought the first large group of settlers to Elwood, when the desperate immigrant ship Glen Huntley landed at Point Ormond in 1840, flying the fever flag and initiating Victoria’s first quarantine station and St Kilda’s first graveyard. Originally a working middle class suburb in the early part of the 20th century, Elwood has overseen waves of gentrification and is now one of Melbourne's most sought after bayside addresses. Large period houses, many from the 1920s and 30s with art deco touches, along with proximity to beach and foreshore, have made the area very attractive. In the late 1970s, like nearby St Kilda, Elwood was known for its nightlife and developed a reputation as a cabaret area. Many of these venues operated out of some of the suburb's quirkier old buildings. As the scene saw a demise in the early 1980s, many buildings, including Maison de Luxe and Moulin Rouge (which operated out of the 1880s mansion "Pladda" built for Captain A. Currie), were subsequently demolished. Despite its history of adversity, a modern suburb now thrives by the bay in one of Melbourne’s most prized locations. Café life in the Elwood village seems a long way from the flood, fire and fever of earlier days. Coloured lorikeets flock to the green corridors of shady trees, a native forest has been planted on the foreshore and the once despised canal area is undergoing rejuvenation as a haven for walkers and cyclists. In 210 a three meter shark was sighted near Brighton and Elwood beach. The Brighton cold water swimmer John Locco and his group of swimmers also known as the Icebergers were informed the shark was seen near them. In the 2016 Census, there were 15,543 people in Elwood. 65.0% of people were born in Australia. The next most common countries of birth were England 4.9%, New Zealand 2.8%, Ireland 1.1%, United States of America 1.1% and India 1.1%. 76.6% of people spoke only English at home. Other languages spoken at home included Greek 1.5%, Italian 1.4%, Russian 1.1%, Spanish 1.1% and French 1.1%. The most common responses for religion were No Religion 48.4% and Catholic 17.0%. Elwood Village is the main shopping strip. Located on Ormond Road, it has many restaurants and cafes. For such a leafy suburb, Elwood is highly built up and lacking in open space. The most popular and largest reserves are bayside, including Elwood Beach, Elwood Canal, and Point Ormond Reserve. Elwood is not without environmental issues, however. The beach and canal frequently suffer from litter pollution and the canal has a distinctive smell resulting from the backflow of seaweed. However, the local council has strategies in place to manage these issues. Elwood is known for its mix of Victorian mansions, Edwardian cottages and interwar apartment buildings. Infill development in recent decades has changed the character of the suburb, however some examples still remain. Sherwood Hall, formerly named "Rotherfield", is a large Victorian (45 room) mansion at 14 Hennessy Avenue. It was built between 1890 and 1891 by David C. Askew of Twentyman & Askew (architects), for Joseph Cowen Syme, who was a co-owner of "The Age" newspaper, for some 12 years. Upon the death of Laura Syme (J.C. Symes' widow) in the 1920s, the mansion was turned into flats. Sherwood Hall is listed in the Port Phillip Heritage Review, 1998. Woy Woy is the earliest of a small group of multi-storied modernist flats in Elwood, it is also the earliest of its kind in Melbourne. Built in 1925–1936 the flats were designed by Mewton & Grounds. Woy Woy is located at 77 Marine Parade, Elwood, Victoria, Australia. The design of the apartment block is extremely minimal. The interlocking cubic forms in the design reveal an interest in architect Willem Dudok. Architect and resident Esmond Dorney, who is best known for his post war Modernist residential work in Tasmania, designed several flats in Elwood in the 1930s including St Kiernan’s Flats (51 Ormond Esplanade), Antigone Flats (34 Docker Street) and Winderemere (49 Broadway). La Tourelle flats, 47A Brighton Road, corner of Dickens Street, is one of the many large blocks of interwar flats in the area, around Brighton Road. Woy Woy, 77 Marine Parade, Elwood, Victoria, Australia. First modernist block of flats in Melbourne. Designed by Mewton & Gounds. St. Columba's Church, opened in 1927. Elwood houses a number of schools, considering its limited area. There are 2 primary schools, one offers a catholic education. Saint Columba's Primary is located adjacent to the church and has access to a large number of facilities. There is also a large public school, Elwood Primary School[permanent dead link]. Elwood is also serviced by a local secondary school, Elwood College, previously named Elwood High School. Elwood Sailing Club was founded in 1924 as Elwood Sea Canoe Club and has since hosted many national and international championships, including 12m2 Sharpie sailing in the 1956 Melbourne Olympics and the 2005 World Formula Windsurfing Titles. ESC now boasts extensive sailing, training and social facilities and the clubrooms are available to the general public for function hire. Click here for live webcam views of the beach. Elwood has a full-time lifesaving club. An active Triathlon club operates in Elwood and the main beach hosts several triathlons each year. The main form of transport is the private automobile and bus. The major roads are on its periphery and include multi-lane Brighton Road, Marine Parade, Barkly Street and Glen Huntly Road. Elwood is no longer serviced by rail. A tram line connecting St Kilda to Brighton, which operated between 1908 and 1959, ran through Elwood, down Mitford Street. After its closure the route was replaced by bus services. Elwood is serviced by the Bayside Trail bicycle path. This path is used by commuters and also recreationally and it includes a roller-skating path, used by rollerbladers. Tram route 67 (Carnegie) runs along the northern boundary of the suburb, along Brighton Road/Nepean Highway to the city or via Elsternwick (past Elsternwick railway station) to Carnegie. The nearest railway stations are about 500 metres beyond the northern boundary of the suburb, at either Ripponlea or Elsternwick (both across Brighton Road/Nepean Highway). Number 630 runs from Ormond Road Elwood to Gardenvale Station, Ormond Station, Huntingdale to Monash University in Clayton. Number 923 runs from St Kilda to Elwood, Brighton Beach, Sandringham to Westfield Southland. Number 246 runs from Elsternwick railway station, via Elwood, Prahran, South Yarra, Richmond, Collingwood (all via Punt Road) and up to Clifton Hill. Many of the streets in Elwood are named after things related to the beach. These streets include Beach Avenue, Spray Street, Wave Street, Tide Street and Foam Street. Other streets in the area are named after famous anglophone writers, essayists and poets, such as Shakespeare Grove, Dickens Street, Milton Street, Wordsworth Street, Byron Street, Keats Street, Tennyson Street, Poets Grove, Ruskin Street and Shelley Street. Like many of the beaches in Melbourne, Elwood is known for its spectacular sunsets. ^ a b Australian Bureau of Statistics (27 June 2017). "Elwood (State Suburb)". 2016 Census QuickStats. Retrieved 13 April 2018. ^ "City of Port Phillip Heritage Review" (PDF). City of Port Phillip. City of Port Phillip. ^ "The Built Heritage". Built Heritage. Built Heritage Pty Ltd.